Aquaculture deals with the farming, breeding, rearing, and harvesting of aquatic organisms, animals, and plants, which includes fin fish, carps, mollusks, crustaceans, and aquatic plants in all types of water environments. 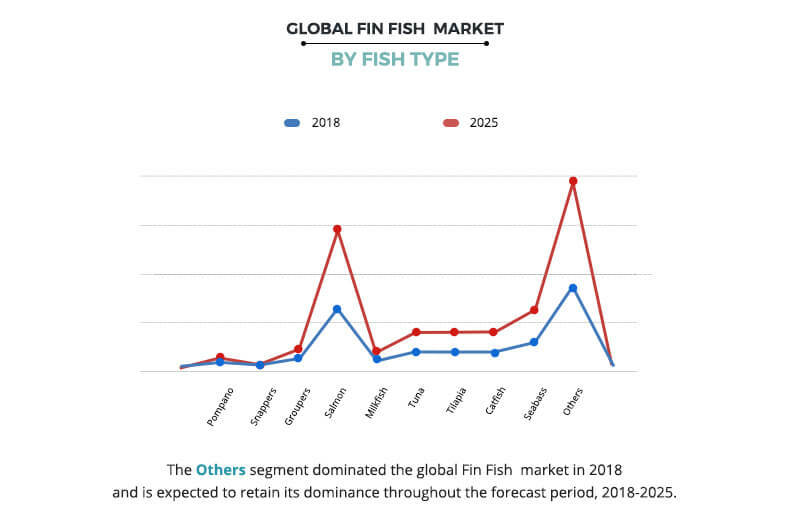 The global fin fish market size was valued at $164,836 million in 2017, and is expected to reach $238,520 million by 2025, growing at a CAGR of 4.5% from 2018 to 2025. The fin fish production/fishing involves feeding, production, regular stocking, and protection of the aquatic living things. Fin fish are cultivated in three types of environment, which includes freshwater, brackish, and marine water. Apart from this, freshwater aquaculture is the leading segment during the forecast period. The aquaculture products that are rich in nutrients are helpful for brain development and eye care. In recent years, there is an exponential increase in the global population due to which there is a surge in the food requirement as well. The rise in food demand is also responsible to increase the fish farming in the globe. The government also supports the fish farming, which is also responsible to drive the growth of the global market. Moreover, the technological innovation in fishing equipment reduces the complications and efforts in fishing and aqua farming. The innovative developments also boost the global fin fish market growth. 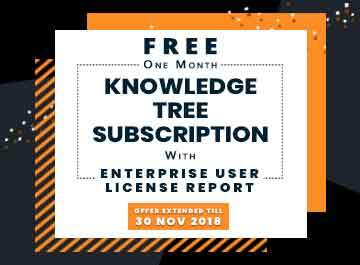 In addition, control of fish reproduction, genetic improvement in finfish, manipulation of chromosome sets in shellfish, and control parasitic diseases in fish drive the growth of the global fin fish market. In recent decade, consumers are getting more health conscious and demand protein products. Fish are the primary source of protein, which also drives the growth of the global fin fish market. However, rise in the temperature and increase in water pollution hamper the growth of the global fin fish market. Evolution in inland fishing and use of more sustainable technology in aquaculture act as the fin fish market opportunity. Among all the types of fish, the other segment that includes carps mackerels, sea bream, and trout generated maximum revenue in 2017. Carps, belonging to the Cyprinidae family, is a very large group of fish that is native to Asia and Europe. The global fin fish market is segmented based on environment, fish type, and region. Based on environment, it is classified as freshwater, marine water, and brackish water. The fish type segment comprises of pompano, snappers, groupers, salmon, milkfish, tuna, tilapia, catfish, seabass, and others (carps, mackerels, sea bream, and trout). Based on region, the fin fish market is analyzed across North America (U.S., Canada, and Mexico), Europe (Germany, UK, France, and rest of Europe), Asia-Pacific (China, Japan, India, and rest of Asia-Pacific), and LAMEA (Latin America, Middle East, and Africa). Based on environment, the fin fish market is categorized into freshwater, marine water, and brackish water. 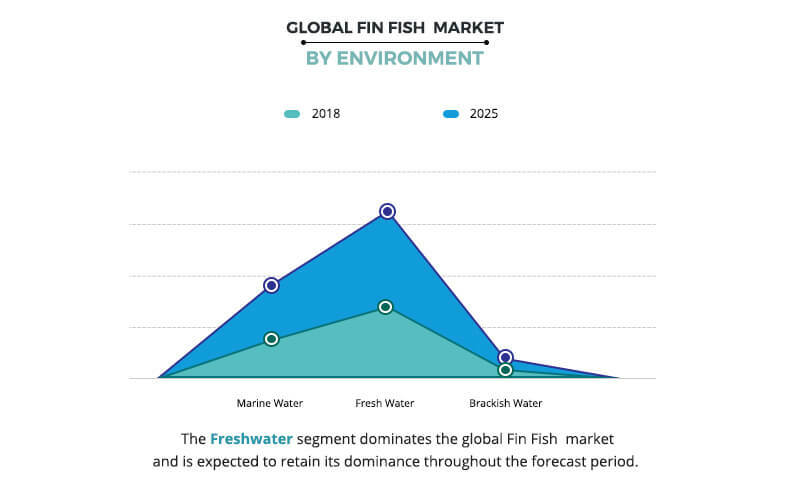 In 2017, freshwater was the leading segment in the global fin fish market, fisheries and aquaculture are governed by fisheries policy in various region such as China, Bangladesh, Thailand and others. For instance, in Bangladesh, the fisheries policy adopted in 1998 included policy for freshwater aquaculture to develop freshwater fish cultivation in the country and responsible to drive the growth of the market. Based on fish type, the fin fish market is categorized into tropical fin fish and others. The tropical fin fish is segmented into pompano, snappers, groupers, salmon, milkfish, tuna, tilapia, catfish, seabass, and others (carps, mackerels, sea bream, and trout). In 2017, tropical fin fish was the leading segment in the global market, due to increase in the consumption of mollusks in food with high nutritional value along with increase in use of luxury pearls extracted by mollusks across the world are some key factors anticipated to boost the sales of major aquaculture players during the forecast period. In addition, use of new fishing techniques and new technologies in the aquaculture of mollusks is expected to drive the growth of the market. Moreover, supportive and favorable government initiatives increase the demand for this fish type in the global market. Intensive salmon farming using open-net cages and techniques such as ranching are some major aspects, which are responsible to drive the growth of the overall market. Advancements in breeding processes as well as increase in use of technologically modern fishing and fish farming techniques are some of major factors expected to increase the overall production of milkfish during the forecast period. By region, Asia-Pacific was the largest market in 2017 owing to population growth, economic growth, and social factors such as traditional fish consumption patterns. The present level of efficient aquaculture technology has helped in increasing the profitability and is expected to further boost the market growth. Some of the major players in the global fin fish Industry analyzed in this report are Alpha Group Ltd., Aquaculture Technologies Asia Limited, Cermaq Group AS, Cooke Aquaculture, Leroy Seafood Group ASA, Marine Harvest ASA, Nippon Suisan Kaisha, Ltd., P/F Bakkafrost, Tassal Group Limited, and Thai Union Group PLC. 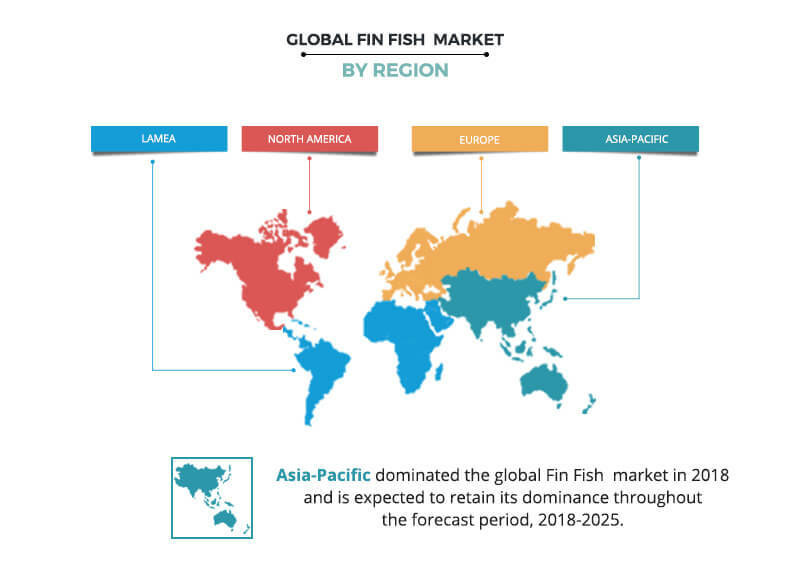 This report provides a quantitative analysis of the current fin fish market size, trends, estimations, and dynamics of the market from 2018 to 2025 to identify the prevailing market opportunities. 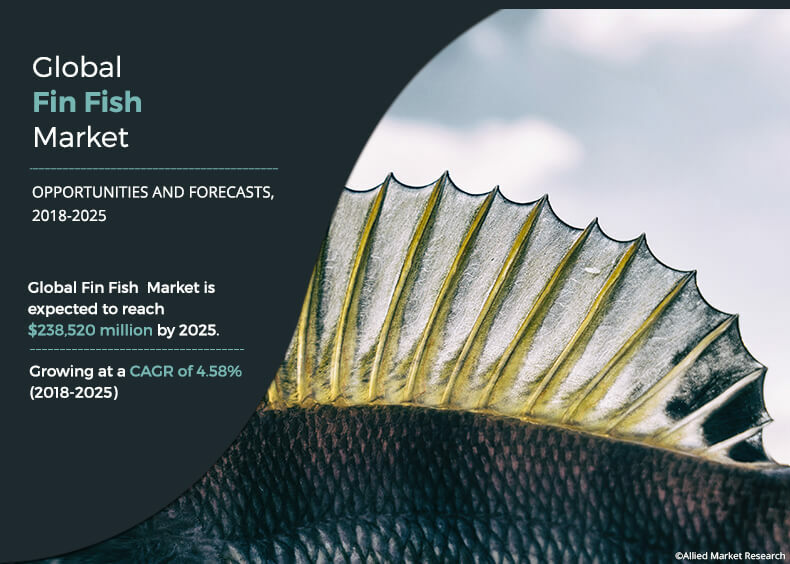 The report includes details of the fin fish market analysis of the regional and global markets, key players, market segments, application areas, and growth strategies. 7.7. Nippon Suisan Kaisha, Ltd. The fin fish market holds a substantial scope for global growth. The market, which is in its growth stage, is expected to contribute significantly to the global market in the next six years. With the government promoting the fish-farming industry, use of new technologies and development of infrastructure in the fin fish industry is driving the market. A large number of players are stepping in the fin fish market with innovative techniques. Rise in concern of the consumers around the world about the intake of protein is also driving the market for fin fish companies. The market is segmented into environment type as marine water, fresh water, and brackish water. The resultant water pollution and change in climatic conditions all across the globe disturbs the aquatic ecosystem, which presents a huge hurdle for the fin fish industry to overcome.